In the first of my interview posts from the Wisconsin Beer Lover’s Festival, I talked with Nate, the brewer at the Great Dane Hilldale location and towards the end of the discussion, executive chef Matthew Moyer showed up for one final question. 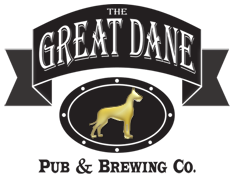 Great Dane brought some pretty solid beers to the party, with their Rusty Lawnmower Amber Lager and their Old Glory American Pale Ale. On a warm, sunny day, both were easily quaff-able and refreshing! WIBG – So, you guys brought your Rusty Lawnmower and your Old Glory Pale Ale today, right? Nate – Yeah, Rusty Lawnmower is a specialty of our brewer Pat who works at our Fitchberg location. He’s fond of making lots of specialty lagers, so this is his summer amber. There’s not a lot of floral hop character. It’s present, but theres a good deal of bite on it its just a real smooth, clean and drinkable. We also brought out American Pale Ale, Old Glory. It’s one of the standards that we always have on tap at all of our locations. It’s a fairly well balanced Pale. There’s still a lot of rich malt character, but of course it’s a Pale Ale so it’s a hop forward beer. It’s hopped exclusively with Cascade hops all the way through. We use about 6 lbs dry hopping and its one of our flagship hoppy ales. WIBG – So, is it primarily late hopped? Nate - We do an initial addition at the start of the boil then we do an addition with 10 minutes remaining, a whirlpool addition, and then a lot of dry hopping. A lot of what we do at the Great Dane is that we try to present a classic style representation. We’re not reinventing the wheel, we’re just jurying to make good classic beers. So when you look at our list we have a scotch ale, several pilsners, we have a hefeweizen. All are very traditional. Most of the beers we are trying to emulate are classic, old world styles. So, when it came to the pale ale, we wanted to make it an American Pale Ale, and who invented that syle, Sierra Nevada. So, we tried to emulate the style and our beer is pretty damn good too. It’s one of our most popular beers, we have to ramp up APA production in the summer time because the amount of people who drink APA’s in the summer just skyrockets. WIBG – Is it one of the beers you guys send out to the Madison Mallard’s games? Nate - IT is actually out at the Madison Mallards, but its not on tap at a lot of locations out there. The more flagship ones that we just go through a ton of out there is our German Pilsner which is an all Pilsner malt base with nothing but Hallertau hops from beginning to end; and then of course our most popular selling beer is our Crop Circle Wheat, a German hefewiezen that also has Hallertau hops, but of course in very small amounts. We sell more of those two beers in the summer time than anything else. That’s what I am making non-stop, just to keep up. We also have some scotch Ale out there at a few tap locations and then we changed a Belgian Pale Ale and added a ton of wheat, its called Belgian Sunshine. They kept telling us they wanted a fruit beer, but we wanted to brew something that we could be proud of. We didn't want to throw together some fruit beer that people would just say, “oh look, it’s got cherries in it”. We really wanted to do something nice and we really loved this sort of Belgian Wheat Pale, so we decided to load it full of orange peel in the beer, and serve it with a slice of orange as well. It really get this nice citrusy character and the Belgian esters from the yeast are really nice, and the mouth feel from the wheat is almost fluffy in your mouth. WIBG – What hops did you use in the Belgian Wheat? Nate - We used Hallertauer. Originally, when we brewed it at the Hillsdale location we used Crystal, because it was something that we had to use soon and we had the perfect amount of hops left to use for the beer. It came out beautifully, but we don’t have any Crystal right now so we decided to go with something that had more noble hop character. Our brewery is a big fan of Hallertau hops, we use a lot of Hallertau hops. WIBG – So, what made you guys decided to come with the andoullie sliders? Nate - Every year we do beer and food here at this festival and it was totally our executive chef’s call. He’s a big fan of creole food and if you look at pub food, if you go to some of the nicer gastropubs and brewpubs, you’re going to find a lot of creative sliders. So, it’s kind of a hip thing that’s going on in brewpubs and that culinary scene. It fits this setting because it’s a small sandwich that you can carry around. Matthew Moyer - We started making homemade andoullie in house, so when we were thinking about what to make for the beerfest I thought it would be a good idea to do andoullie sliders. So, we made the patties and then tried to pair them up with the beers and it turned out nicely. It definitely pairs well with the APA. That’s all for today, still more interviews to come, so keep checking back! Shoot us a message via our website and let's connect. Great blog! we also did work work with Great Dane in Fitchburg.